Honinbo Shusai (本因坊秀哉 Hon’inbō; Shūsai, Tamura Hoju, Tamura Yasuhisa (田村 保寿), 1874 – 18 January 1940) was a Japanese professional go player. Honinbo Shusai was the 21st and last hereditary head of the Honinbo house, and 10th and last historic Meijin. He played a role in founding the Nihon Kiin, turned the hereditary Honinbo title over to the Nihon Kiin to be used as a tournament title, and was a student of Honinbo Shuei. Prior to becoming the 21st head of the Honinbo house (1908), Honinbo Shusai was known as Tamura Yasuhisa. This was the name that appeared on his kifu when he was still a pupil of Honinbo Shuei. Shusai’s 1938 retirement game against Kitani Minoru was the subject of Kawabata Yasunari’s famous novel The Master of Go. 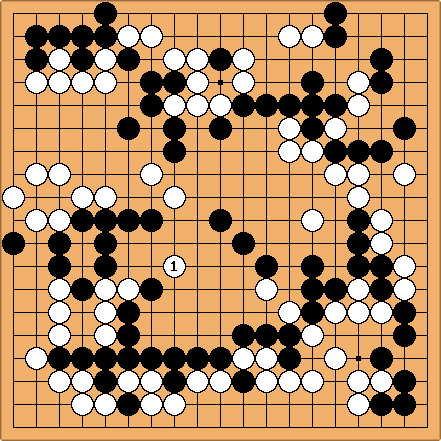 Shusai played a famous game with Go Seigen in which there was a lot of controversy surrounding multiple adjournments during the game. Maeda Nobuaki is supposed to have been the one to find in the following diagram. There was, of course, a lot of controversy surrounding this accusation. The game to one side, Go had the following to say on Shusai in the interview: "Was Honinbo Shusai a villain? He was a scoundrel! How the Ki-in manages to deify this person of all people is unbelievable!" vol.1 of his Complete Games. 126 games covering 1887-1897, with commentaries from Igo Shinpo magazine. vol.2 of his Selected Games. 68 games covering 1899-1938, with his own comments.